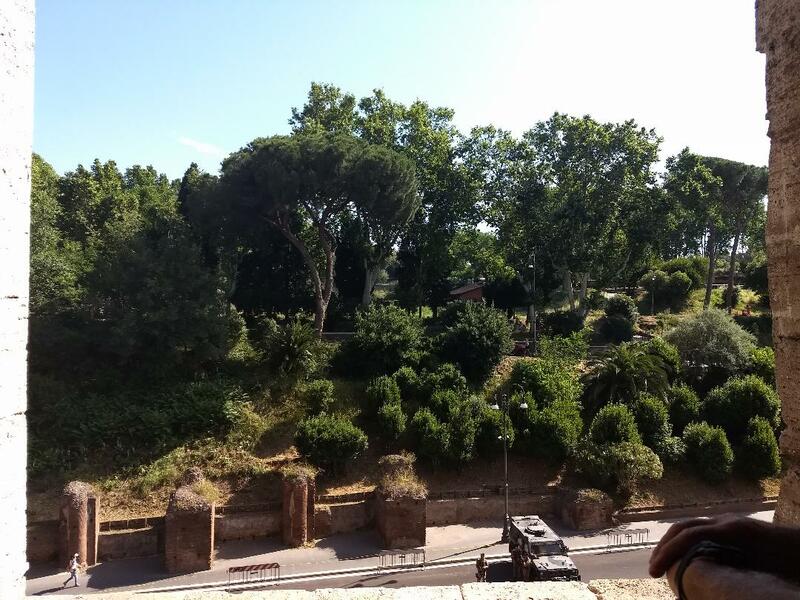 On our last day in Rome Gianluca scheduled a tour with a tour company called, “A Friend in Rome” for the Colosseum. This was on Izzy’s bucket list and we almost missed out because it was booked so far in advance. We got the best guide. Her name is Gioia. It’s pronounced Joy-ee. It was a private tour and lasted two and half hours. We started inside the Colosseum and immediately learned that it actually derived its name from a colossal statue that was at the entrance. She brought us to an arch and pointed to a mounded hill in front of us. Underneath the hill lies the golden palace of Nero… you know, the insane guy who burned part of the city to make room for his palace and private pool. He wasn’t exactly popular, so when he died they covered the palace with dirt and built an arena instead where the pool was. A farmer was working his property in the 15th century and fell through the roof. Originally a giant 98ft bronze statue of Nero was out front (later melted down for weapons). It was called the Colossus, hence the name Colosseum. This ginormous place held 85k people. 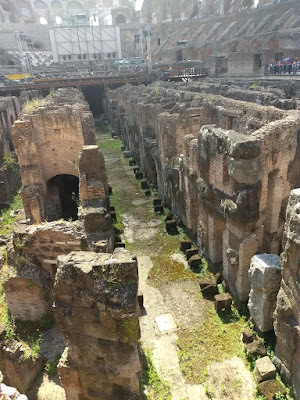 We heard about the atrocities we all know about and a new fact to me… in the first year or so its arena was filled with water for mock sea battles (remember the pool). Joy-ee guided us around the tour groups to shady spots and explained each vantage point. 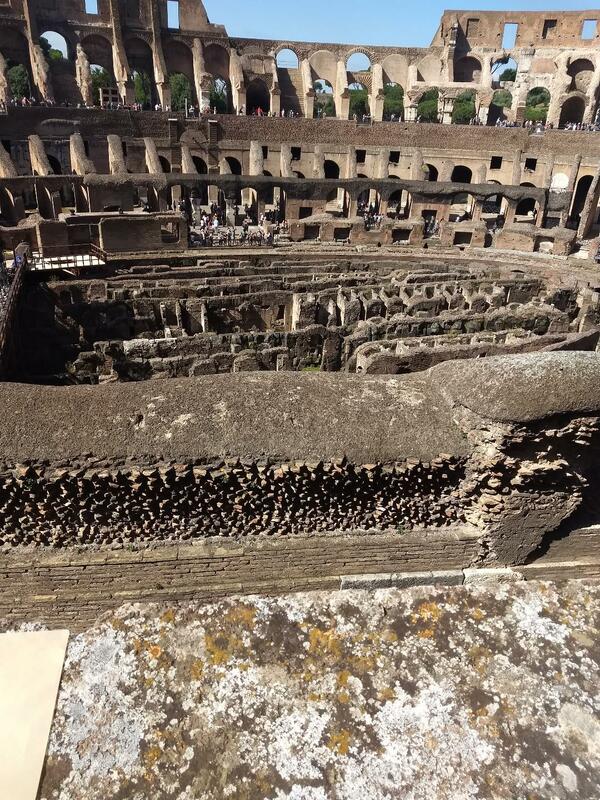 She even explained the giant movie screen being erected down where the gladiators fought. A showing of the movie Gladiator was planned in a couple of days and Russell Crowe was suppose to be there. 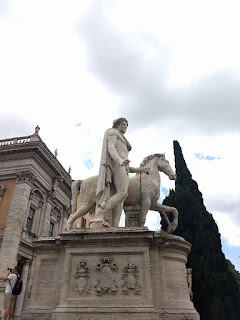 So, I know this is irreverent to the massive machoism of the gladiator, but Izzy and I got to giggling about how we don’t know anything about these men represented with giant statues except their looks. Maybe they had a really weird way of walking with their capes and skirts. Maybe they took super short steps or long ones. Maybe they wore makeup and died their hair purple. Maybe they had high-pitched voices. Who knows how they moved down the street? All we have are these big grey statues with giant thighs and broad foreheads to tell us their story. 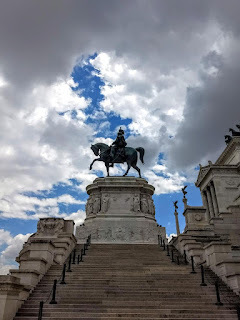 Then we left and went across a clearing to the arch of some Roman dude and saw the victory over the Jewish people in Jerusalem combined with the victorious Cesar of the day with Nike at his back to show clearly who won. 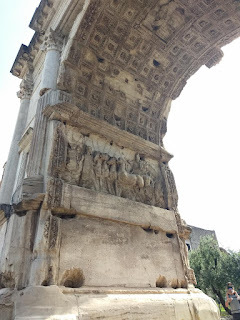 Then we went through the forum. 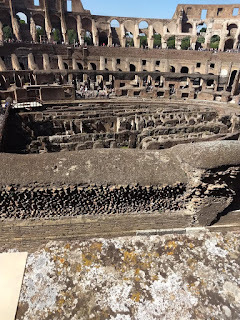 This fascinated me because it was covered in two thousand years of dirt until 1929 when Mussolini ordered it excavated. The history behind it is amazing. 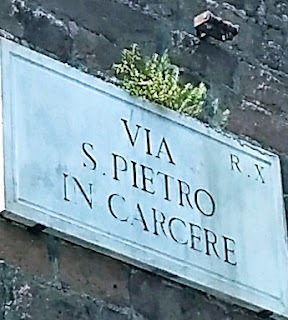 All of this had made us wonder about Paul and Peter’s imprisonment in Rome. We asked our guide if she knew where they’d been imprisoned. Yes, she did know and she took us directly to the spot. I was in awe. We finished our tour at the base of the “big white building” (Piazza Venezia). She called it the Wedding Cake. It’s a much later addition to the city (built in the mid 1400s) and considered a disgrace by the inhabitants because it destroyed so many ancient artifacts and buildings to place it there. We climbed the Wedding Cake and took the obligatory photos and went in search of an Irish Pub. Joe was positive he knew where one was. After two hours of aimlessly walking in circles we gave up and headed towards the Metro, and tada!... we found one. Joe was so happy.